Unfortunately, since I wrote this post several years ago, the owner, Caroline Breckenridge, has passed away. 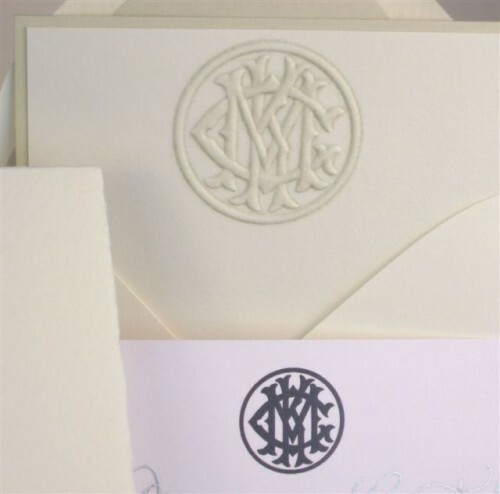 Please continue on to read about her work and for monogram design inspiration. I don’t remember how I found Monogram Inc. but I’m certainly glad I did. 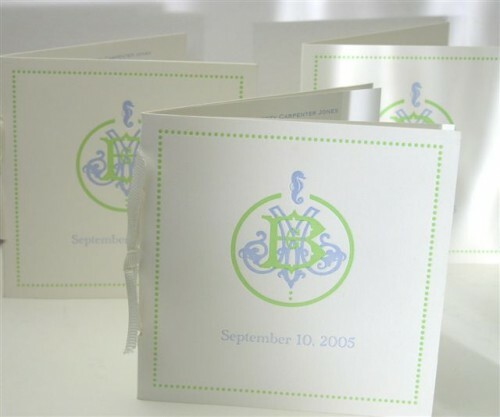 Founded by owner Caroline Breckenridge in 1999, Monogram Inc. is a fabulous source for custom monograms. Caroline is a delight to work with and produces the most exquisite designs which can then be used for a variety of projects. 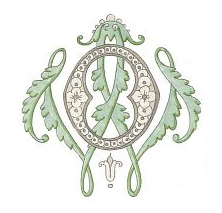 The history of monograms is fascinating and Caroline explains a bit about it on her lovely site. Markings on linens were originally used solely for identification purposes. As linens became woven from more expensive fabrics for the wealthy, they would spread things in the meadow to dry after washing, often to show off their household possessions. But these expensive linens were occasionally stolen, so families starting marking their collections. 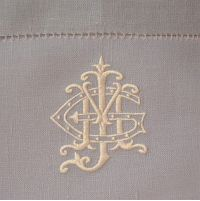 Monograms officially began in the 19th century when French kings and nobles began to embroider their linens with the more elaborate markings of crests and coats of arms. The beauty of the monogrammed products added to the aesthetic appeal of the households and confirmed their status and wealth. In the 1800’s, trousseaus became popular, the monogrammed linens again indicative of the family’s wealth. Today, of course, monograms are enjoyed for their lovely artistic appeal. 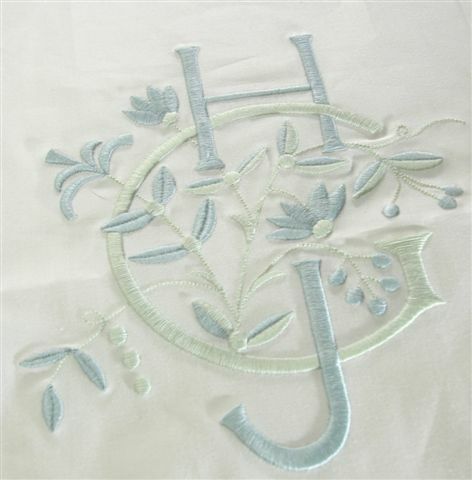 I originally contacted Caroline to create a monogram for my sister as a special Christmas present, which was then to be embroidered on sheets. Caroline always does several iterations to choose from and we finally decided on this beautiful design. Caroline works with wonderful suppliers and the beautiful monogram was then transformed into stunning monogrammed bed linens, much to the delight of my sister. That present was so successful, that on subsequent birthdays and holidays, my sister received monogrammed towels, stationery and gift enclosures, paper guest towels and spectacular dinner napkins. I recently had the opportunity to catch up with Caroline, who was kind enough to answer a few questions. Q: What was your professional background before starting the company? CB: I’ve always been surrounded by creative people throughout my career. Town & Country Magazine, assistant to a commercial still photographer, film production, etc. I worked for the largest commercial film production companies in NY from 1978 to 1989 as a production manager. There were 6 directors on staff at any one time and myself and another girl oversaw every aspect of production i.e. crews, sets, locations, equipment, props, wardrobe, casting and on and on. Without knowing it you learn a lot [along with a snippet of everyone’s professional craft] and are able to produce an amazing outcome within a few days. They say that if you can “do production” you can do anything! Q: How did you get interested in monograms and what made your decide to leave your “day” job to start the company? CB: Well, I burned out finally after about 20 years in the field and decided to take a break from the stress level of that crazy business. While on vacation in the Caribbean, we were staying in a house that had the most beautiful hand embroidered antique linens on the beds. I took a minute to reflect on the fact that no one does this anymore and wouldn’t it be fun to try to bring this unbelievable craft back to life in a more modern way. When I got home, I did some research [production background] to find out that I really had no competition. I found some reliable sources to do the embroidery, sourced my linens and taught myself how to draw in this weird and rather precise way. Although I do not do the embroidery myself, I had to learn their craft by osmosis so that I could speak to them intelligently and work through the problem areas. I have a few wonderful people here in the U.S. that take their craft very seriously and really understand how to interpret my designs. The digitizing of the design is the most important factor when I turn the design over to them. We all seem to collaborate nicely and it shows in the end product. Q: How do you decide on a particular style for a client? CB: I have to interpret what the client wants. Keep in mind that I never get to see their houses, but have to imagine based on what they tell me the style that suits their needs. I usually start out with a few preliminary drawings to see if I am going in the right direction for them and then the client gets back to me with their comments and I continue. CB: I work with lots of different clients actually. Party planners, decorators, private clients, and also supply embroidery to some linen companies. I enjoy working with all of them and get excited with every new project. My favorite place is my drawing desk; least favorite is bookkeeping. CB: Once a monogram has been designed, it can be used on almost anything. Embroidery, stationery, etching, engraving, jewelry, etc. Embroidery is a different process than artwork for any of the other items. If a customer wants both embroidery and stationery there are two steps. 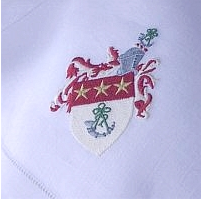 Embroidery requires digitizing for the embroidery machine and camera ready artwork is required for anything printed. 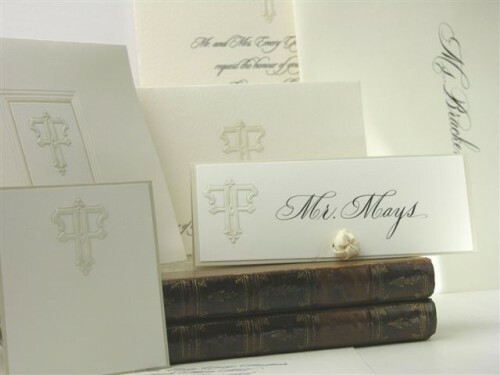 I work with and recommend a wonderful stationer/engraver called The Printery in Oyster Bay, NY. They do the MOST beautiful work! I also work with a wonderful artisan who can hand engrave/etch the monogram on silver or glass. Q: What would you say is the most popular item. 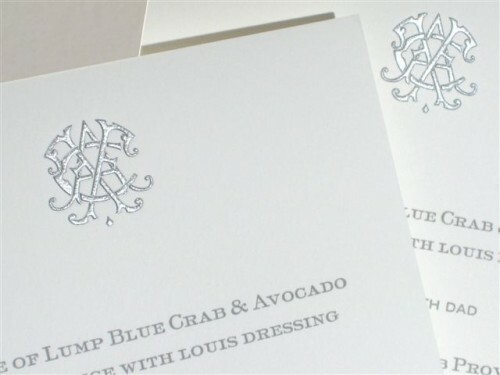 CB: I’ve done everything including burgee designs, family crests, paper napkins & guest towels for weddings, etched champagne glasses for the bride and groom, hundreds of linen cocktail/dinner napkins for weddings, entire bedrooms and bathrooms for families and am currently working on a monogram for a yacht which is fun. It’s all so much fun and look forward to getting up each day to think of something more that I can do for someone. Love when people are happy! How could they not be with such spectacular results! This entry posted in design, interior design, monograms, Stationery. 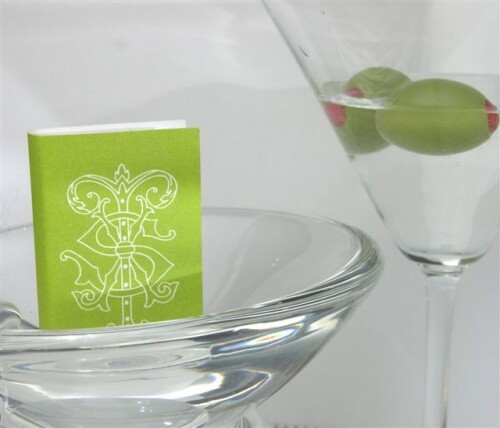 Entry Tags: Monogram Inc, Monogrammed Linens, Monograms, Monograms For Stationery, The Printery Bookmark the permalink. Stacey: I want one! 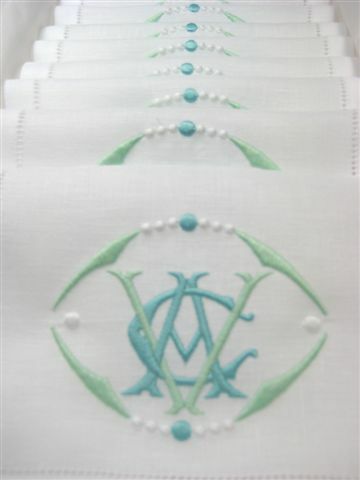 The idea that I could have a completely unique monogram designed for me to use on all my linens, for some reason hasn’t crossed my mind. Where have I been. It would have been fun to meet you in High Point, maybe NYC in November. See our gathering in Velvet and Linen. Liz – and you could use it on so many other things as well. Carolyn is very talented and a delight to work with. Saw your fun group – looks like a great time – wish I could have been there. NYC in November would be great! Oh yes…..this I love! Haven’t seen a monogram I didn’t. So happy to know more about Monogram Inc. Wonderful post!!! Thanks – thought you’d like it! Monogram Inc! Sounds right up my ally…these are divine, can’t wait to see more! She does beautiful original work – she has a large gallery on her website. Great resource! This Southern gal loves a monogram. You’ll love working with Caroline – she’s the best! Thanks for posting this beautiful work, Stacey! 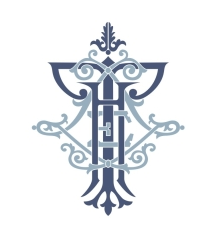 I’m a big fan of the Monogram Inc website & have had it saved as a favorite for sometime…truly exquisite and inspiring work! 83 queries in 0.530 seconds.